I just received a couple of 'tweets' from Beth Kanter and Allison Fine about a report they co-wrote for the Case Foundation about the America's Giving Fundraising challenge from last fall. Its a great read, and I highly recommend you read it too. You can find it here. Each cause had at least one personal 'champion' who leveraged their networks and friends and worked many many hours to activate them. "... cause champions [people who participated in the Facebook 'Causes' contest] found that impersonal group emails were completely ineffective." "A mix of activities was evident in all of the successful efforts that included Internet, mobile-based activities, and in person solicitations." It's not just about the money! "Yes, we're thankful we won the money. But the exposure for our organization was priceless." Just my two cents from the sidelines, but I think a big part of the 'secret sauce' is the passion and motivation of each of the people who worked on the campaigns. Their personal belief and willingness to talk about it and express it to everyone provides the fuel for the engine. Down to the last 24 hours on Case Foundation Challenge! The Case Foundation is putting a 'spotlight' on interesting projects that promote a participatory culture in our communities. I'm really fortunate that our little region has one of those 'spotlights' on it. Our Deliberative Democracy project has won $10,000, and we have a real chance to win another $25,000. It works like this. You can click on this link. And vote for 4 projects. We hope that one of them is our Deliberative Democracy Project. The four with the most votes each gets $25,000. PLEASE VOTE TODAY! Case Foundation's Make It Your Own - Vote Today! Are you fed up with polarized politics that too often leaves problems unsolved, and want to support concrete projects that are finding new ways for people with competing ideas to find common ground? If the answer to that question is YES, then vote today. HERE. Now. Okay, please VOTE for the Deliberative Democracy Project. Hands Across North Quabbin's Deliberative Democracy Project is a finalist to win $25,000 from the Case Foundation. The Deliberative Democracy Project supports 9 towns in the North Quabbin area of rural Massachusetts to come together to find common ground on issues that concern everyone and how to address them. HANDS needs your vote to win this national competition. The top 4 vote getters will each win $25,000. And while you're at it, we have a neighbor who could use your vote too..
Can you help by voting today, and passing the word along? ...I think it points to the difference between “organizations” trying to mobilize online supporters, and people trying to mobilize other people. For some reason this really got me thinking about why I got involved. Maybe this is sort of obvious, but if its not personal I don't think I give. So the question is how does it become personal to me? Then, what motivates me to give, or prevents me from giving? I like Beth and want to be seen in her eyes as someone worthy. I want to help her if its not too much of a burden on me. I’d like to do the challenge myself for the cause that is important to me, but it feels overwhelming to me. Beth’s cause is a good one... and more importantly, she is an intense believer in it. She appears to have absolutely no problem in telling the entire world how great this is. This is something I wish I could do. Why is she a winner? I am overwhelmed by the amount of requests I get for giving. How does this one get to the top of the pile? The more I am asked to give, the more the personal relevance of the cause increases. I can afford to give $10. It seems that this process is then repeated down the line with my friends and contacts who have their own set of reasons why something is personal to them. I'm not sure what those things are. I started to write down some ideas and felt that I was treading on murky territory. I wish Beth Kanter would do a survey asking people. If only one could get the email list from Global Giving. So what does that all translate into? Not sure if this adds to the conversation, but it really got me thinking. Why do you give or not? The contest is over in ten days! The Sharing Foundation is currently in 1st Place! And to win we need to keep the donations coming in- just $10 is all that you need to contribute. And you can do that here. Today there is a special challenge. "Global Giving is offering additional incentives to heat up the competition - over the next five days, the organizations that get the most donations in a single 24 hour period will receive an additional $250, plus the largest donation will be matched. So, if you haven't contributed yet, this would be an excellent time to donate $10!" I hope you will consider giving if you haven't already, and if you are really inspired to see the effects of this social media experiment, see how many others you can inspire to participate too! To celebrate her 51st birthday on January 11th, Beth Kanter is "...trying to get 51 people to donate $10 in 51 hours to the Sharing Foundation's America's Giving Challenge over at Global Giving." I just wanted to add my voice to the group. This is a super cause and I know that we can win. The top 4 groups that receive the most donors will get $50,000 from the Case Foundation / Parade Magazine. Currently the group is in 5th place. So this is really possible! I'm a contributor. Can you help too? The America's Giving Challenge is a competition sponsored by Parade Magazine and the Case Foundation, challenging non-profits to raise money from as many donors as possible. The minimum gift is just $10. The top winners will receive $50,000 from the America's Giving Challenge. My dear friend and colleague Beth Kanter with great leadership support from Michele Martin are trying to win this challenge for The Sharing Foundation. I know they can do it, because Beth helped the Sharing Foundation win a similar challenge last year with Yahoo. I've donated to this campaign and ask you to do so too! Just click on the America's Giving Widget on the left and donate today. You can also help by clicking on the "Share This" button and sharing it with your friends. The Sharing Foundation is this amazing organization that helps lift Cambodian children out of poverty through programs like its Khmer literacy school. It helps farm children learn their native alphabet and numbers well enough to attend elementary school. The Sharing Foundation's English Language Program offers village students, ages 8-18, the opportunity to learn English, allowing them to obtain jobs in tourism and word processing. These students are so dedicated that some meet on their own to study on weekends. 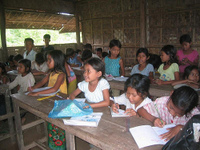 The literacy school runs three sessions a day for 130 children of Roteang village’s poorest families. Ten bilingual Cambodian college graduates teach English to 500 students in 19 sections offered daily after school hours at the village school.